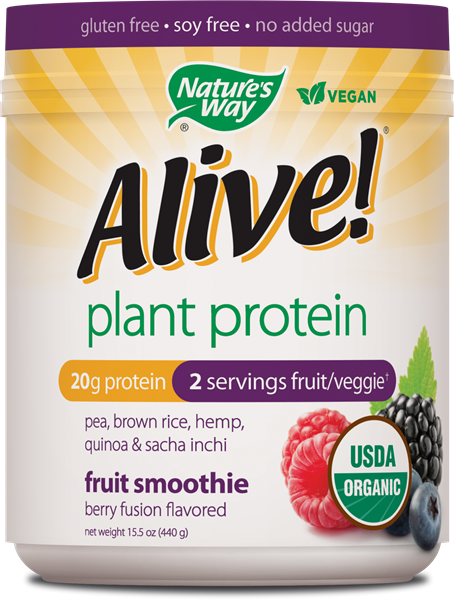 Alive!® Plant Protein (Berry) - Nature's Way®. Combine 2 scoops with 8 ounces of cold water or your favorite vegetarian alternative milk (rice, soy, almond, coconut or hemp). Mix well in shaker or blender for best results. Scoop included in canister. No tree nuts, fish, shellfish or FD&C colors. No added sugar. †Each 44g serving (2 scoops) provides the equivalence of 1/2 cup fruit and 1/2 cup vegetable (volume before drying). Organic Pea Protein, Organic Apple Powder, Organic Carrot Powder, Natural Flavors, Organic Brown Rice Protein, Organic Red Beet Juice Powder Color, Organic Hemp Protein, Organic Quinoa Protein, Malic Acid, Organic Sacha Inchi Protein, Organic Stevia Leaf Extract, Organic Blueberry Powder, Silica.